Please choose the color that you want from the dropdown menu above. 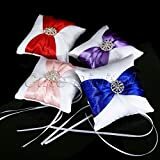 White ring pillow decorated with white double bow ribbon, pearl by romantic, fine Workmanship, full Of Sweetness. White pearls decorate on the ribbon, give you the best visual impact. A strap at back for holding.Two hanging ribbons are used to fasten the ring. Small ring pillow, carrying your happiness, let all guests to witness your love.